A beautiful view of scenic Bull Mountain in Patrick County. This 17.75 acres would make an excellent mini farm with plenty of cleared land for horses, cattle, etc. Only minutes to the Blue Ridge Parkway. 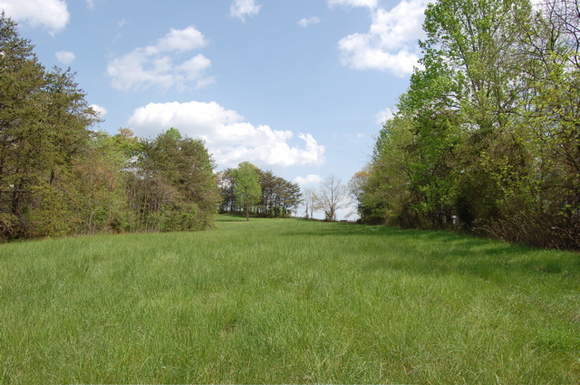 17.75 beautiful rolling acres with a good balance of plush meadows and nice woods. The land is gently rolling and offers a spectacular view of Bull Mountain. Located on a very lightly traveled dead-end state road, the tract has already been issued a permit for well and septic and all easements are in place for electricity and phone. Great place for a full time residence or weekend cabin. Sit back and enjoy the beautiful scenery, and watch the deer and turkey as they travel your land. The land is restricted to modular homes or better. Call us today for you showing. Another look at the land. The view from the field. A plat of the 17.75 ac.